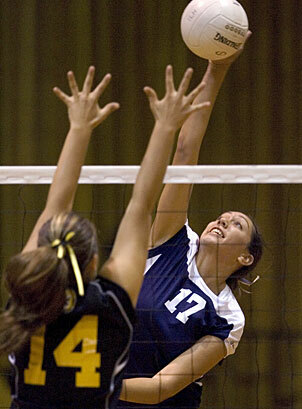 Kamehameha's Alex Akana attempted a kill against Hawaii Baptist last night. The Warriors defeated the Eagles 25-23, 28-26. Top-ranked Kamehameha took the best shots Hawaii Baptist could give, but escaped with a 25-23, 28-26 volleyball win last night at the Eagles' gym. Freshman Misty Ma'a and junior Taylor Akana led a balanced Warriors attack with six kills each. Middle Alex Akana added five kills and two aces. Kamehameha improved to 8-0 in the Interscholastic League of Honolulu. Coach Chris Blake was simply relieved to get a win. "HBA is a very good team regardless of classification. I'm happy with the way our team fought back," Blake said. "It's important for us to be put in adversity situations. We had a lot of errors today, and a lot of that had to do with HBA." Hawaii Baptist provided the toughest challenge yet for the Warriors. The Eagles are a strong favorite to capture another Division II title in the ILH, but seemed quite capable of upsetting the three-time defending state champion Warriors. "I'm proud of them. They battled," HBA coach Myles Shioji said. HBA (5-1) hit reasonably well against a big block - .222 - and got 13 kills from Sarah Palmer (.571) and 10 more from C'era Oliveira (.304). "We couldn't stop C'era," Blake said. "We tried to put a lot of pressure on Sarah. We're lucky it worked out the way it did." The battle with the taller Warriors got tougher because of HBA's uncharacteristic misfires from the back line. The Eagles committed 10 service errors and had just one ace. "We could've played better. I could've game-planned better," Shioji said. "Maybe we were serving the wrong person. Sometimes you have to take the errors with the tougher serves. You wouldn't throw a fastball down the middle to A-Rod." The opening set went back and forth with four lead changes. Kamehameha's 11-2 run was fueled by Whitney Viveiros, Ma'a and Taylor Akana, and the Warriors led 20-13 after a kill by Alex Akana. HBA, which had four service errors in its first rotation, rallied behind Palmer. The junior slammed three kills in a row to help bring the Eagles within 24-23, but Talia Jardin and Ma'a teamed up to block Palmer's ball to end the first set. The Warriors didn't have a service error until the second set, when they committed four. "We were chasing HBA after they settled down and played their normal game," Blake said. HBA hit .333 in the first set, but just .146 in the second. Still, the Eagles used their 1-2 punch of Palmer and Oliveira, who got plenty of sets from Kayla Kawamura and Chelsie Mow. Hawaii Baptist led 15-12, but a serving error, hitting error and bad set allowed Kamehameha to tie the game. Kills by Alex Akana, including one on a back set from Caitlin Andrade, gave the Warriors a 22-19 lead. Mistakes by the Warriors, plus a kill by Palmer, helped HBA tie the game at 22. A net violation by the visitors put the Eagles ahead 23-22. HBA had a chance to win the set at 24-23, but Ma'a came through with a kill from the right side. Kamehameha trailed 26-25 when Alex Akana pounded another kill over the middle, and then delivered her second ace of the match to give the Warriors the lead. Taryn Bohan's swing then went long from the right side, and Kamehameha had its closest win of the season. Kamehameha hit .300 for the match. Andrade finished with 21 assists. "HBA plays really good defense, they've got two mean hitters and they play a steady game," said Viveiros, who had one of her team's three aces. "We knew HBA is really good at passing." The two teams won't play again until next year. The Eagles are moving forward. "We know what to do to prepare for the next game," Oliveira said. "It just fires us up. We just gotta clean up a few things." The Top 10 high school girls volleyball teams in Hawaii as voted on by coaches and media from around the state. First-place votes in parentheses. Ten points for first-place votes, nine for second, eight for third, etc. Not including last night's results. Team, Record Last match Next match PTS. PVS. » Also receiving votes: Waiakea 9, Mililani 7, Farrington 6, Waimea 3, Seabury Hall 2, Kamehameha-Maui 1, Maryknoll 1, McKinley 1. » No longer in top 10 (previous rank): Mililani (No. 9).